Yippee, I arrived in San Francisco, had a blast of a time (even on my own), and found time to visit the restaurant recommended by a friend. There was any number of restaurants I wanted to visit, and the next trip is going to have to go some way to marking off the long list, but am so happy that I managed to get to the Slanted Door (www.slanteddoor.com). The restaurant is in the Ferry Building, looks out onto the harbour, and is always busy. Charles Phan certainly knows how to put it all together. I must apologise first up for the photos, I was so into the food (“modern Vietnamese cooking”) that I nearly forgot to take the photos! Oops. I arrived a little late, around 1.30 and there were no tables available, but was offered a place at the bar “if you can find one”. Heck, of course I could, though I had to walk the length of the bar to take a seat right down the end. But actually that was a great place as I got the best view along the bar, as well as a peek into the kitchen – which was one organised busy place. The people to my left were just finishing off their oysters. 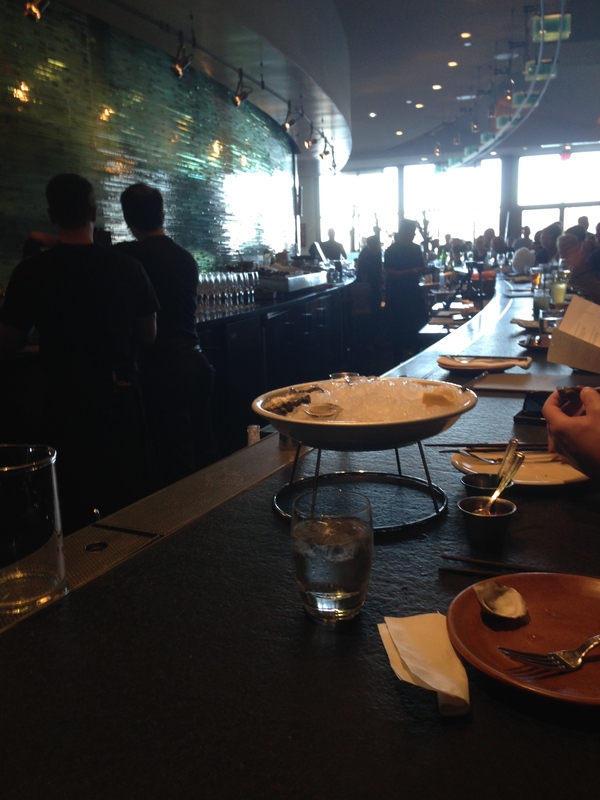 I’m told they are one dish you should try here, but I am not an oyster eater so I passed on that one. As I was on holiday I figured a cocktail wasn’t amiss, so ordered a ginger limeade off the menu. 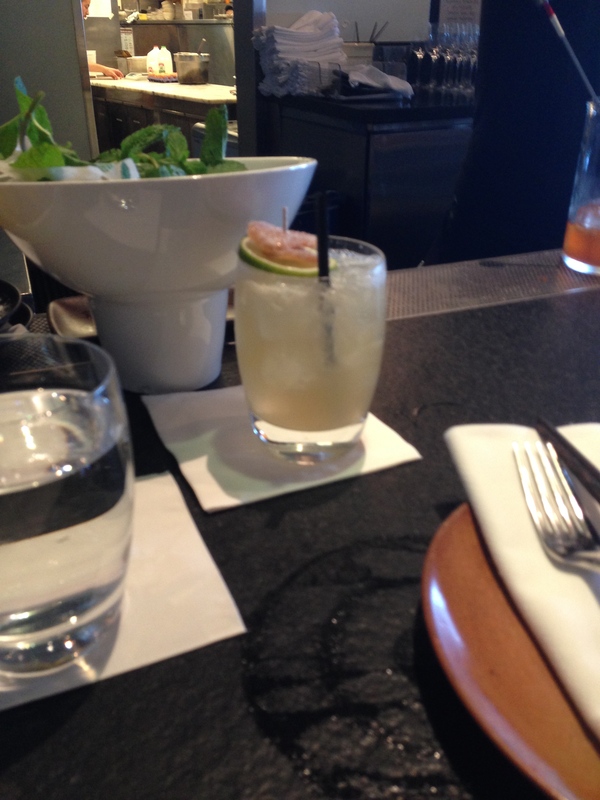 MMM; hangar one kaffir lime vodka, ginger, lime, rocks. Yep, it rocked me. 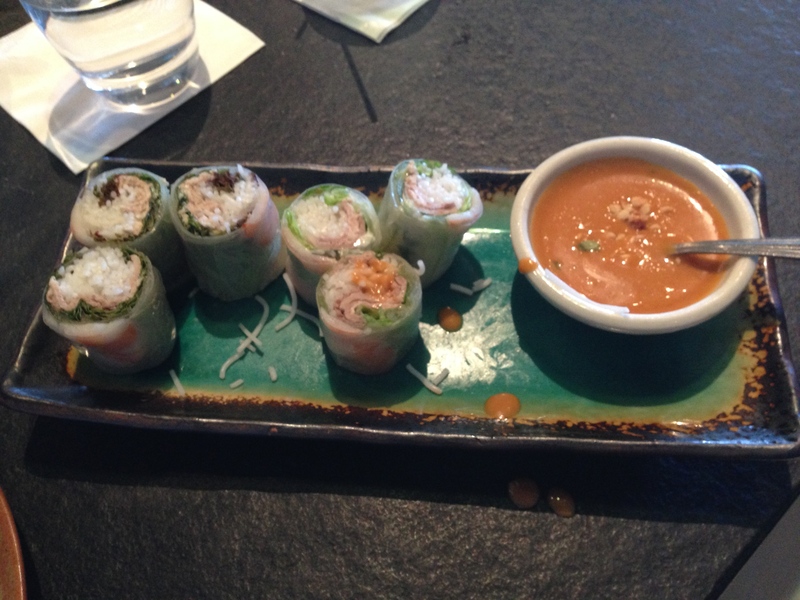 For the starter I chose the slanted door spring rolls : gulf shrimp, pork, mint, peanut sauce. They looked amazing, but I thought they were just a little too chilled to really meld all the tastes. The mint made a nice touch, and the sauce was very very good. Final delight was what I had been recommended I must try. The Five-Spiced Duck Confit Salad. And, yes, it was all I had been anticipating. 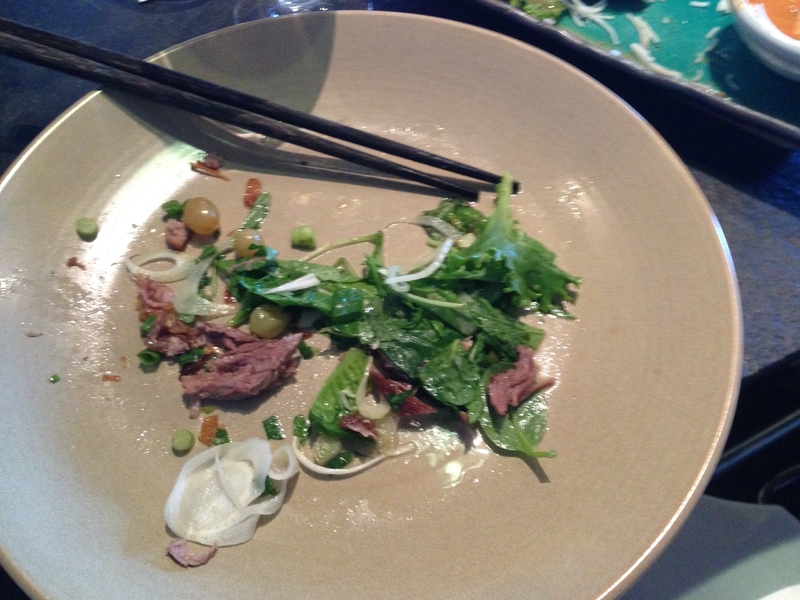 Ingredients: mesclun mix, pickled grapes, shaved fennel, ginger caramel dressing, fried shallots and of course the duck. Small, enticing pieces of crispy, tasty duck, it was totally a delight. The pickled grapes were tiny and perfect. It was all so wonderful that I nearly forgot to take a photo, just remembered before I demolished the entire serving………..
it also happened to be the maitre d’s birthday, so not only did I enjoy special food, but he also offered me a glass (or so) of bubbles. That, combined with a glass of pinot gris was a fine complement to the food. Definitely a must return and next time a booking to get a table that looks out over the harbour.